This is a list of known West African and diaspora Orishas, Vodun, Lwa, notable Spirits, and Deities. I’ve gathered information from a variety of sources. It is by no means a complete list, and different cultures have different names and pronunciations. There are said to be over 400, aside of those individuals have discovered and/or adapted to their cultures. MamiWata.com has an excellent page on the relation of the Yoruba and Fon pantheons. It is an important read for anyone who suspects they may not be getting the whole story of what Vodun is. If you know of more Vodun, Orishas, Lwas, and West African or syncretized diaspora Spirits, please contact us to add them to the list. Discuss the list on Orisha List at Facebook. Abata/Abatan – swamps and marshlands, wife of Erinle. Associated in the Americas with the nursing and practical care professions. Abuko Vodun, Abukir – the Fon and Dinka first woman, first female ancestor, upon her physical death merged with Dan Ayidawedo to become the sky, rain, and fertility Goddess. Adjassou-Linguetor – Haitian Rada Lwa of spring waters. She or he (depending which tradition) can be found under mombin trees, and reportedly has a very bad temper and protruding eyes. Mombin trees are well known for their medicinal properties. Afa – Anlo Ewe of the sacredness of divination. Also known as Kpoli. Afefe – the wind, the messenger of Oya. Do not invoke. Aganju, Aggayu Sola – volcanoes, wilderness, and the desert. Agassu, Agassou – father of the Fon, was born from princess Aligbonon and a leopard or panther. Agau – Haitian Lwa of Nature’s rumbling and noise. He is in the rumbling of storms and the crack of lightning. Agbe – Ouidah master of humans and the sea, third son of Mawu, twin brother of Naeté, similar to or perhaps the same as Agive. His holy day, January 10, is national Vodun Day in Benin. Age – barren wastelands, deserts wherein there are no plants. Agidai – in charge of the ability to speak prophetically (afudashe) and cowrie divination. Agué – one armed or one legged or one eyed leader of all Aziza (forest Spirits) who taught men the secrets of medicinal and poisonous plants. Similar to Ochossi and Osanyin. Agwe, Agive – Goddess of the Sea for some in Benin. Haitian Lwa of the sea and sea life, protector of sailors and owner of all ships and navy. Overlaps with Yemaya and Olokun. Aja – the “wild vine”, teacher of medicine/herbalism. Aja-Oshu – Venus near the moon. Amadioha – Igbo Alusi of thunder and lightning, consort of Ala.
Aña, Anya, Ania – sound/vibration of impact, percussion, percussion instruments. Anansi – Akan trickster spider, embodiment of wisdom and cunning. Ananagu – daughter of Olokun, similiar to Pandora, but became a guardian after opening the chest. Ananu, Nyawe-Ananu, Nwoyeh-Ananu – suffering, more specifically the suffering from disease, daughter of Sakpata and (fraternal) twin of Zodji. Andriamahilala – name for the first woman (who became or merged with the Moon upon her physical death) of various tribes. Aroni – the forest, has one withered limb. Asase Yaa – Akan Goddess of fertility and the Earth and possibly Jupiter. Wife of Nyame, and mother of Tano, Bia, and Anansi. She is worshiped in fields, not temples. Ashe, Ise – divine energy or power. Some may relate to this as a being in and of itself, while others view it as the divine thread that connects all types of matter…more of a phenomenon than a personified being since it is a part of the Great Unfathomable. The word “Ashe!” is used as a pronouncement of giving something energy, or as a blessing of power. Atai – Efik mother Goddess, who gave humanity conflict and death to keep the population under control. Ayayo – younger sister of Oya, associated with malevolent witchcraft. Do not invoke. Ayida (or Aida) Wedo – the rainbow in Haitian Vodou, manifests with her husband, Damballa. Ayizan, Aizan – speech, communication, and public spaces, especially the marketplace, initiations, wife or mother of Eshu. Exorcises evil Spirits, and helps to communicate with, calm, and send away merely inconvenient ones. In Haitian Vodou, she is also regarded as the first Mambo. Bade – Haitian Lwa of wind. Bakulu – Haitian Petro Lwa of ruin and misfortune. Do not invoke. Baron Samedi – Haitian Vodou Lwa of death. Husband of Maman Brigitte. Bayanni/Babayanmi – sister of Shango, and lives inside of the crown of cowries worn by priests of Shango. Bia, Bea – Akan God of wild animals. Bosou Koblamin – Haitian petro lwa of “berzerker” type warriorship and protector of night travelers. Boyuto – mirages (on land or sea), and illusions. Brise – Haitian lwa of the hills and woods thereon. He is protective of children, and sometimes takes the form of an owl. Though he is thought of as generally benevolent, he can cause insanity with overexposure. Bromu, Boromu and Brosia, Boronisa – the companion or twin guardians of the secrets of Oduduwa. Bromu is the child of Yewa and in charge of dessication and drying, whether for purposes of preservation or mummification or sucking of energy through the evil eye or other life sucking or vampiric magic. Brosia is in charge of tornadoes and energy that roots things out and decimates specific areas. Chukwu – the Igbo Odinani name for the Almighty Unfathomable. Because it is unknowable by mere mortals, it relates to the world via the Alusi. Da – Fon/Daxome sacred serpent who encircles the Earth to protect it. Embodied by the Atmosphere for many modern adherents. Dada – growth, newborns, and vegetables (Yoruba). Alternative name for the Creator (Fon). Damballa Wedo – the powerful sky serpent of Haitian Vodou, husband of Ayida. Egbe, Egbe Orun – the “heavenly gang” or collective Spirit of various beings living in the Orun. They work closely with the Egungun. In some systems, they are or include the souls of beings from other planets, so they could be viewed by some as other life forms’ Egungun. Also in charge of still waters including water in jars. It is a good idea to ask for their blessing when making floor washes, vinegars, and the like. Egungun – the collective spirit of the ancestors. Ekwensu – Igbo Alusi who is the force of testing, bargaining, cunning, and negotiation. He is also a trickster, but in the way of teaching. Erinle, Inle – The Orisha of health and medicine in general, he is a hunter as well as a healer. Erzulie – Haitian Vodou lwa of love, with many manifestations including but not limited to Erzulie Dantor, protector of women. Fa, Fa Adegun, Fa Aeidegun – Fon master of destiny, keeper of fate. He is in charge of the Du or Kpoli. Fride – music made with strings/stringed instruments. Gbadu – Fon/Dahomey Goddess of fate, has sixteen eyes and sees all. She is androgynous, but often referred to as female for simplicity and because she has born children. Among them are Minona, Gu (Ogun), and Dan (who became known as Damballa in Haiti). Gelede – the female Ancestors. Gran Bois, Ganga Bois – Haitian and New Orleans lwa of the forest and herbal medicine. Ibu Aye – Oshun as a child or the youth of Oshun. Ikenga – Igbo Alusi of time, passages, achievement, success, and associated benefits. Igwe – Igbo Alusi of the sky. Irawo – the stars, shooting stars and thunderballs, astrology. Irawo-ale – Venus as the evening star. Iroko – the sacred Iroko tree. Iya – first woman, the Yoruba “Eve” made from clay by Obatala. Jakuta – the original, pre-incarnation of Shango. Kori – protector of children. She has a soft spot for Abiku, children who died before the age of 12. Korikoto – protector of anything/anyone that is gestating, from negative energy brought by hate, envy, and other types of ill will. Often represented by a scarecrow. Logun Ede, Laro – son of a manifestation of Oshun (Oshun Iponda) and Erinle, considered by some to be the patron of GLBT, but by more African minded folk it’s probably heavier on the B and T.
Loko – also called Papa Loko, the Haitian lwa who guards the hounfour or place of gathering/worship and community. Husband of Ayizan in some regional traditions. Maaselobi – the spark from which Shango was born from Olorun. Maman Brigitte – syncretized with the Irish Brigitte, wife of Baron Samedi, Haitian Vodou Lwa of the comforting or protective aspect of death and the immune system. Mawuga Kitikata – Anlo Ewe Creator of Earth. Mawu Lisa – The dual Daxome Creator of Earth, Mawu (Moon) and Lisa (Sun), twin child of Minona, and parent of Da. Minona – Fon protector Goddess, first child of Gbadu. Nana Buruku – the primordial fertility/reproduction Goddess. Opponent of the evolutionary and technological aspects of Ogun. Nanu – a female manifestation of Babalu Aye. Njoku Ji, Ahia Njoku – Igbo Alusi of yams. Nyame – Akan deity of the Sky and leader of the Abosom (“lesser deities”) and Spirits. Son of Ngula even though he created her. Since Christianization, his name is used to describe the Supreme Being. Oba – first wife of Shango, Orisha of dutiful wives, marital obligation, nurturing, motherhood, and marriage. Obalofun – “lord of speech”, the first man. The Yoruba “Adam” made from clay by Obatala. Odede – father of Ochossi, father of poisons and patron of “witch doctors”. Odu Ifa – The specific destinies or fates, the first 16 of which are each an Orisha in their own right. Odudua, Oduduwa – father of the Yoruba people, co-creator of the world, keeper of the secrets and mysteries of the Egungun (Ancestors) and Iku (Death). Ofere – Venus as the morning star. Ogan – war general of the first Orishas. Ogboni – embodies the relationship between humans and Onile (the Earth). In charge of unity and social transactions. Very helpful when you need to get someone on your side or to get justice against someone who has betrayed you. Oke – mountains and high hills. Oko – agriculture and farming. Olodumare – the Supreme God and Creator of the Universe. Because He is Unfathomable, He relates to mankind or other physical beings through his emissary Obatala and avatars or children of Obatala. Olokun – Brother and/or consort of Yemaya, an Orisha of the sea for some Yoruba peoples. God of the sea for Bini people in Benin, he has been a little too overshadowed by the female aspect (Yemaya) in the Americas. Olori-merin – towns, possibly civilization. His worship has fallen out of favor (and rightly so) due to his requirement of gruesome human sacrifice that may well have been a test to see if people were sufficiently gullible. Olosa – Orisha of lagoons, wife of Olokun. Onile – the Earth, master or mother of the Earth, depending where you are. Associated more with the land or mass of the Earth than the water. Onzocaire – a benevolent Haitian loa who is said to grant wishes in exchange for a head of a sheep and a litre of whisky. Just a warning, it is not quite so simple. Ori, Ibori – each person’s personal Orisha, guardian, or spiritual self. Oro – the force of law/law enforcement on Earth. His physical manifestation or humans being ridden by him are never to be seen by women or else they will die on the spot. He also embodies the male mysteries and mystique…that “something” that should be in all heterosexual and dominant men. Orun – the sun or the home of the planetary Orishas for our solar system. Orungan – the ideal male or anthropos, youth, reflection, and the love that comes from admiration. Orunmila – the Deity of knowledge and wisdom. Some refer to him as the Word of Olodumare, as he is the source of Ifa and Ebo. He transmits knowledge through the Ifa oracle and some believe all forms of divination. All priests/counselors of any flavor of Mami Wata derived faiths should pay him respect because he is from where we receive messages. Osanyin – owns all plants, master of herbal medicine and magic. Osara – waterfalls, cascades, vertical or semivertical flowing waters. Oshumare, Anyiewo – the rainbow serpent. The bridge and encircler between and around the Orishas and mankind, the spirit and physical realms. 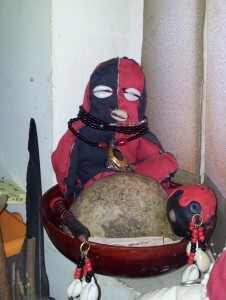 S/he is protected by Eshu, and sometimes embodied in Oya’s garments. Oshun – second wife of Shango, Orisha of beauty, romantic love, prosperity, fun, and feminine dance. Oti – name means “liquor” or “rum”, four breasted one, an Orisha sympathetic of the sorrow of women who are mocked or made fun of. This could be to say that she embodies the “liquid confidence” women get when they are intoxicated. Otin (maybe same as Oti) – the servant of Yemaya who, according to an apataki, saved her life in a battle with Oshun. Oya, Yansa – third and favorite wife of Shango, Orisha of thunder, storms, wind, change, female strength and martial arts. Oye, Ojo – the wind, air. Accompanies Oya. Ozain, Osanyin – a forest Orisha and owner of omiero. Pomba Gira – Brazilian Candomble consort of Exu. Her paths are called upon for help in matters of love/lust. Pulu, Pulo, Pooloo, Pululu – music made with wind/air and wind instruments. Segbo – Fon Creator, also known as Se Medo (Master of Creation), Ainon (Owner of Earth), Dokunon (Master of all wealth/riches), or Dada (The Creator). Segbo means “the Great Soul” or could be interpreted as “the Great Spirit”. Shango – fire, lightning, male dance and martial arts. Originally Jakuta. Son of Aganju. Associated with Heyvoso (Sogbo). Shokponna/Babalu Aye/Sakpata – smallpox, AIDS, the plague, and other contagious diseases. Sigidi, Shigidi, Shugudu – bringer of nightmares or tormentor of the guilty through nightmares. Tano – Akan God of War. Togbui Nyibla – Anlo Ewe guardian of the state. Determines and guards legitimate kings. Yemaya, Yemanja – Mother of life on Earth, guardian of the seas. Associated with Ala. Said to originally be the Goddess of the Ogun river, but since she is the Mother of all waters, expanded to be all oceans and seas later. Associations overlap with Agwe and Olokun, depending on the region. Yembo – the old mother aspect of Yemaya who gave birth to the celestial bodies. For the scientifically minded, this could represent the collective parent spirits of all the planets and stars, or mother of Yemaya. Yeve – Anlo Ewe deity of Thunder and sacred drumming, also called Tohonu. Yeye Lembo – mistress of the culinary arts. She taught Oshun to cook, and as the story goes, the student surpassed the teacher, but Yeye Lembo is still very respected and called upon to find creative recipes as well as to charm food. Zaka, Azacca – Haitian Lwa of agriculture. Zodji, Dada Zodji, Obaluaiye – Dahomeyan king of the Earth, son of Sakpata, and twin brother of Nyawe-Ananu who is also his wife. The Lukumi Pantheon – an article by Willie Ramos with a list of Orishas worshiped by the Lukumi/Santeria and associated sects. Orishas (Deities) Worshiped in Yorubaland – a list compiled for the Old Naija blog of deities worshiped in Nigeria and surrounding areas. Edo Deities and Spirituality – very brief overview of Edo spirituality and a partial list of Edo deities. Arabian Paganism – the basics of spirituality in the pre-Islamic middle east and Arabia, with a list of deities. 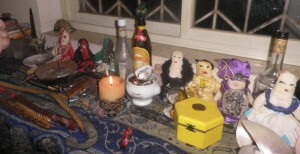 abosom, african orisha, akan, alusi, angels, archangels, featured, igbo, list of loa, list of lwa, list of orisha, list of orishas, loa list, lwa list, obosom, odinani, orisha, trowo, vodou, vodun, voodoo, yoruba. Bookmark. Obatala and Olodumare are NOT the same Orisha.. And some of these are Orisha and some are Lwa. Big difference. Where did you get your info about Obatala and Olodumare out of curiosity??? Shannon, I’m attempting to sort through some of the elitist posturing for this list. It would be more helpful if you explained what you view as the difference. Thats a great thing to do! Its interesting I’ve seen this same thing a few times with Obatala and Olodumare…I wonder where people are being informed. Olodumare is God and seen as ompnipetent and Obatala is an Orisha. It would be like saying St. Peter and Jehovah are the same. Does that make sense? Didn’t mean to come off snappy i just see sooo much information on the internet about these kind of things! The Olodumare is the Unfathomable Universal Force/Creator. The Obatala is essentially the relationship between the Creator and the physical universe. It is a “separate” Orisha/Vodun in that it is many degrees away from the Origin of all things, but it is as close as any created being can ever be to it. So the avatar/embodiment/idea/emissary of Olodumare would be Obatala. They are kind of the same, but not the same in that we can communicate with Obatala and relate to him to a degree, but we can’t possibly psychologically get anywhere near Olodumare. For the purpose of listing, I think you are right. I should list Obatala as the emissary of Olodumare or king/assigned creator of the planet Earth, and Olodumare as King/Creator of the universe. also why would more african minded folk consider Logun Ede, Laro more likely to be the Patron of bisexuals and transgender people than of the gays, lesbians, bisexuals and transgender? I would really appreciate further information. Why is Babalu Aye not listed anywhere on this website? He is in the Orisha list.